James started on his spiritual path at the end of the 90s when he took a sabbatical from IT consultancy in Luxembourg. He travelled throughout South-East Asia for several years, learning martial arts and yoga in China, India, and Thailand. 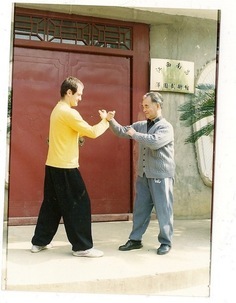 In 2001, feeling drawn to a more physically active monastic environment, I travelled to China to study at the Northern China Academy of Shaolin Martial Arts. Disappointed at the lack of interiorisation I found, I went looking, and discovered my first teacher, Master Wan An Ping, in Jiangxi province. Standing motionless for up to 14 hours each day, I was graced with experiences which, although unclear and misinterpreted, reinforced my suspicions that there was more to the Universe than I had previously seen. When the SARS virus hit, I had to make a quick escape from China, and found myself back in Thailand, where Swami Vivekananda Saraswati had just arrived. Eastern mysticism with Western explanation. “Inspirational and life-changing was the dinner I shared with Swami. He unravelled some of the China experiences for which, up until then, I had no explanation. It felt like I’d found something, and someone really important." I stayed at Swami’s side for the next several years, throwing myself into my practice with the same determination that China had shown possible. I also took on much of the management of the school at that time, from accounts and website design, to lecture videoing and teaching. I consider myself very fortunate to have been on-the-ground during those first formative years. Evenings sitting with the older students were a fun and blessed time. Upon moving back to England, I studied biomedical science and nursing at the University of East Anglia, before taking the reins at a private medical clinic. Until June 2014 I was a serving medic in the British Army Reserve Forces. In 2008 Ania and I started our first school together, and in 2014 we opened “Eternal Yoga” in Norwich. I am, at heart, a karma yogi, but love the mystery of the siddhis (paranormal powers), the rewards of fasting and tapas, and the challenges of yoga and awareness in daily life. My favourite book is Paramahamsa Yogananda's "Autobiography of a Yogi", and I feel very blessed to have received initiations into, and to be a student of Yoganandya's Kriya Yoga from both Paramahamsa Prajnanananda and Swami Shankarananda Giri. I am eternally grateful for the Grace, love and support I have received, and my Masters' continued presence.